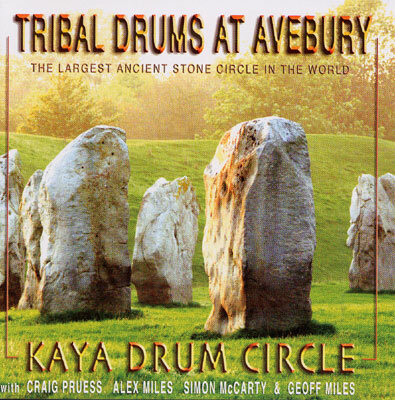 The Kaya Drum Circle has been active in the Wiltshire area for over a decade, enjoying a rich and rewarding interaction with the local community, offering beneficial drum circles and workshops. The stone cirde at Avebury Henge is one of the truly amazing local attractions. Now, this professional recording of the Kaya Drum Circle, 50 drummers gathered at the sacred site, has set a new standard in the recording of pure excitement and energy. Taking place at key times of the year (Spring Equinox and Winter Solstice), these sessions are unique points in time that capture the primal energy of the landscape. Conceived by Geoff Miles, founder of Kaya Drums, and local musician/film composer/record producer Craig Pruess (composer of the feature films, Bend It Like Beckham and Bride & Prejudice and the TV series Peak Practice), this high fidelity digital recording puts you right amongst the vibrant and powerful drumming of this experienced group. Playing under the expert facilitation of Alex Miles, Simon McCarty, Laurie French, and Geoff Miles, this CD is truly energising, varied, organic and mesmerising! There is an accompanying full colour eight page booklet which gives the background to Kaya Drums, induding information on available workshops, and their support for a school in The Gambia, as part of their Afrikaya project.